Cave Direct Beer Merchants is the UK’s only specialist beer company that aims to deliver all our beer direct. This means we can care for the beer properly, make sure it arrives safely and avoid adding extra margins to our prices. It also means we can help out immediately if things go wrong. Currently we can deliver to over 90% of the UK's population via our own fleet of trucks, and within the next few years will delivery to the entire country. 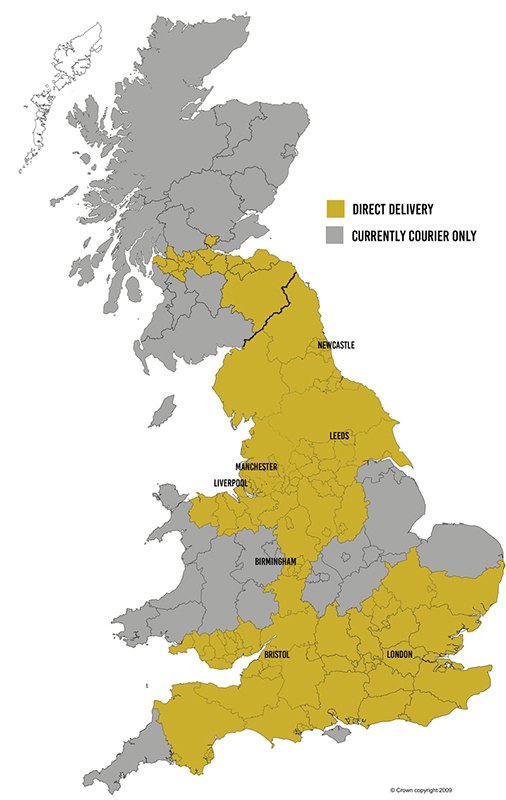 If you are in the gold areas we should be able to deliver your beer direct via our drays, but if you are in the grey areas you'll need to use our courier service for now. If you are unsure simply call us or drop us an email.